This summer I’ll be away from the Big Island for almost two months, so I decided to spend some time at my favorite beaches. Everything looks different because we had so much surf and storm damage in late winter. 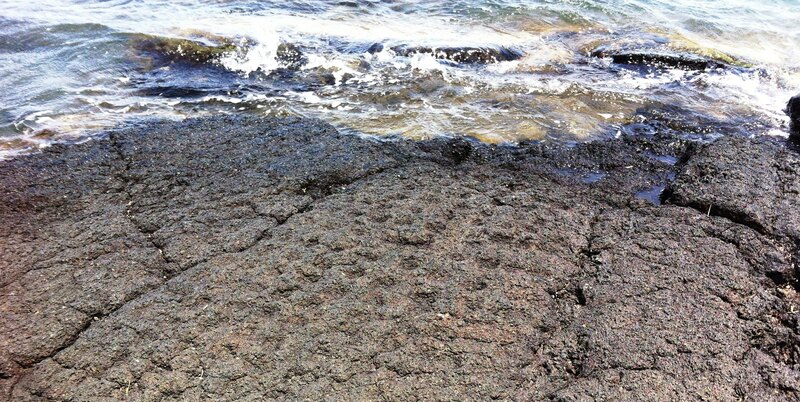 The storms took the sand out to sea – as much as half of each beach. Large rocks that didn’t get wet in the past, now sport a healthy dose of green moss, and some landmark rocks are completely immersed. 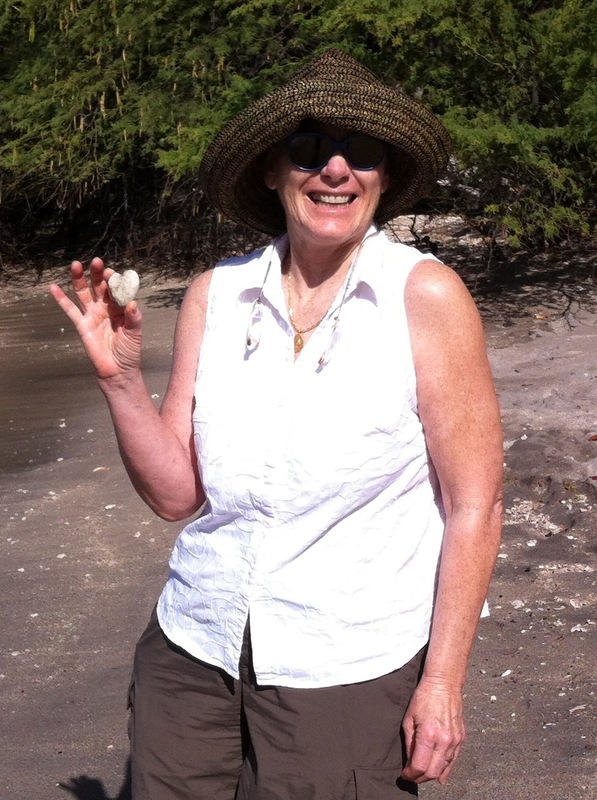 While wandering the shore looking for coral, I decided to call Dr. Deacon Ritterbush, aka Dr. Beachcomb, and take her up on an offer of a lesson in beachcombing. A leading expert on sea glass and the beachcomb experience, she believes that beachcombing encourages coastal stewardship, leads people to better emotional, spiritual and physical health, and provides a fun way to learn about ocean science and human history. With her archeologist husband, Tomasi Patolo, she has developed a passion for learning about history from bits of settlement debris that wash up. 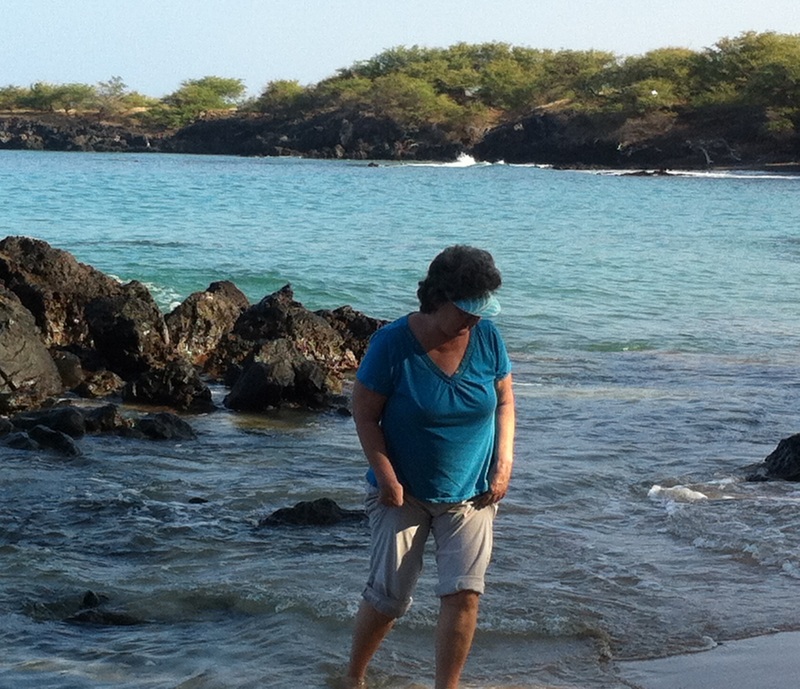 Dr. Beachcomb took me to a site I’d never been before on the Kohala coast. 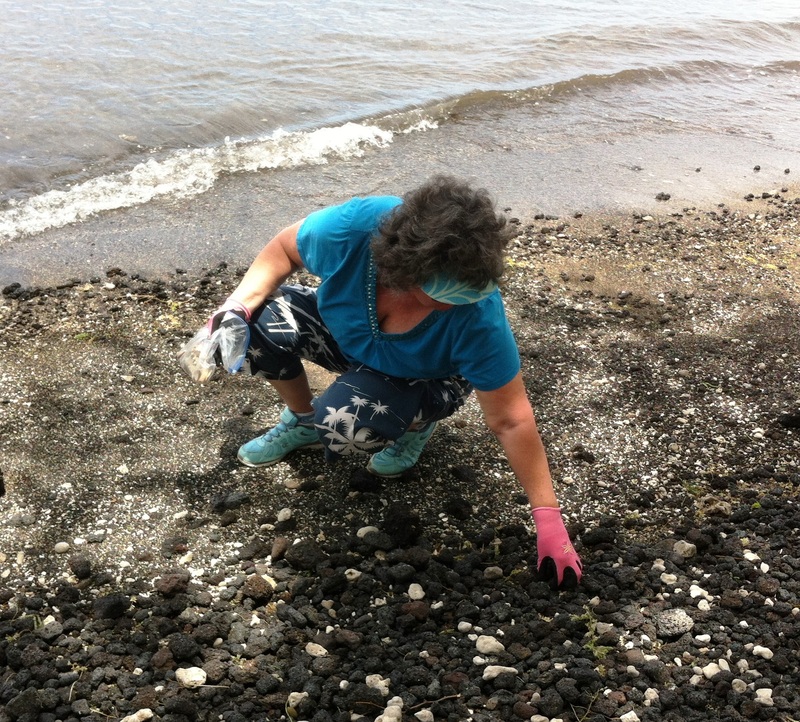 As we walked in from the road, she explained that the beach treasures she and her husband have found in this area, can be traced back to 400 years or more of Hawai‘i’s settlement history. You can see evidence of Native Hawaiians, whalers and explorers, missionaries, plantations and late twentieth century life. Over the last century, it apparently served as a dump-site. When the big storms came in this winter, the water surged in 30 or 40 feet beyond the normal shoreline, unearthing glass and pottery fragments from the dump-site and sucking them into the surf. 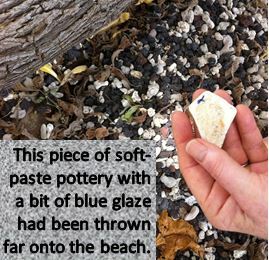 Under her tutelage, I found several pieces of soft-paste porcelain, some with bits of the glaze still attached, though most were abraded clean by the action of the sand and surf. Soft-paste porcelains were European and American potters’ early attempts to duplicate the coveted hard porcelain wares from China: http://en.wikipedia.org/wiki/Soft-paste_porcelain. 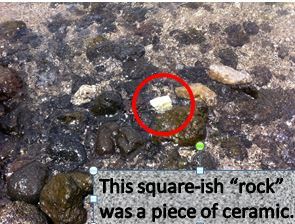 Many soft-paste porcelains were made of varied mixtures, including old animal bones and they don’t hold up well in surf. Deacon’s tip: “Look for square shapes. The dishes break into squares.” By 1771, the secret to making hard-paste porcelain was out, but soft-paste porcelain production continues to this day. http://en.wikipedia.org/wiki/Hard-paste_porcelain. 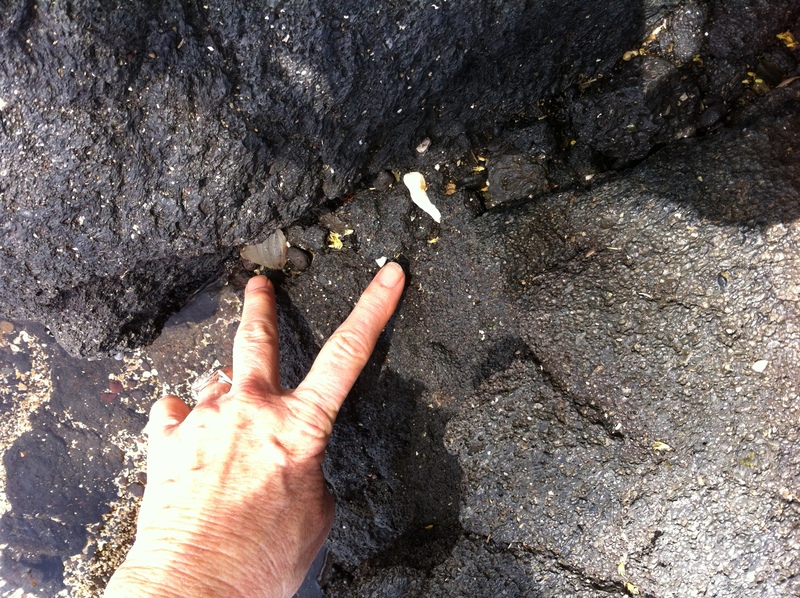 Over time, Dr. Beachcomb has found pieces of black glass along the Kohala coast including bottle lips that date back to the late 1700’s and early 1800’s, a time when whalers, merchants and explorers plied Hawai’i’s shores. So Captain Cook, who was on the Big island in 1779 (and lost his life there) may have had more European compatriots than early accounts reveal. Deacon didn’t expect to find much this day, because she and her husband had visited just a few days before. 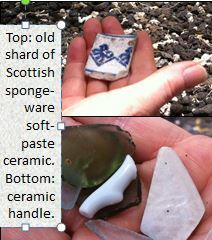 But in the hour we were there, she found three pieces of Scottish soft-paste spongeware as well as a hard-paste handle. I carried a few treasures home too. I also took away a feeling of serenity, proving that beachcombing is, as Deacon says, “as good for the head and spirit as it is for the pocket treasure you find.” It’s a meditation. 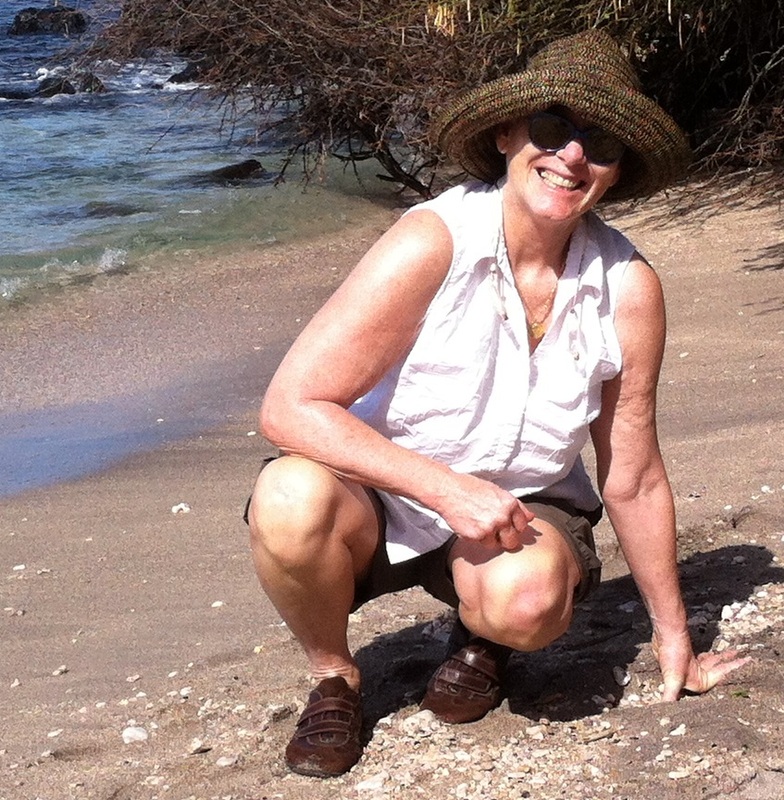 If you want to learn more about beachcombing, see her website (www.drbeachcomb.com). She’s also putting on a Beachcombing Conference (the 6th annual!) in the fall. Check it out: http://www.thebeachcombingconference.com/index.html. Even though I’m a newbie beachcomber, I’m pretty sure I’ll attend. She promises a long fun weekend of lectures, field trips, beach arts and photography classes. Where? Along the ocean of course, this time, in Pacific Beach, Washington. Be a kid again, The Passionate Beachcomber, and Blown Away – Damon Point and Ruby Beach. 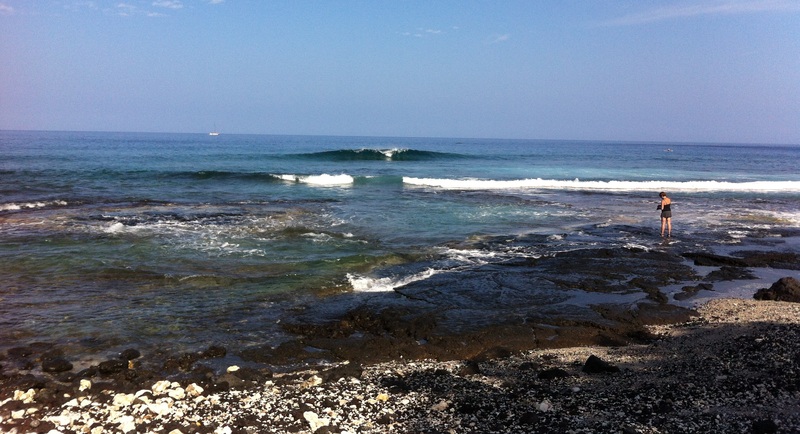 This entry was posted in beachcombing, Hawaiian history, lava, Serenity rituals, Things to do on the Big Island and tagged beachcombing, Dr. Beachcomb, International Beachcombing Conference, manifesting serenity, sick glass. Bookmark the permalink. Aw, great piece, Diane! Did you find any bonfire glass over there? We went beach coming on Guimmes Island in the San Juan Islands off Anacortes Washington at the end of April when we were home for my bother Bill’s funeral. We found some nice stones and shells but only one tiny piece of turquoise glass. However, it was a restful contemplative time. Let us know when you will be back in the mid-West next. 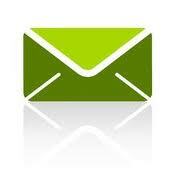 Just call (920) 682-8988 and we will clear our calendars.